The Conductors’ Class works together for six hour per day both with pianists and with the Orion Orchestra, under the direction of Toby Purser and ENO chorus master James Henshaw. Classes will cover aspects of conducting technique and philosophy, musicianship and score preparation, aural awareness, and rehearsal skills. 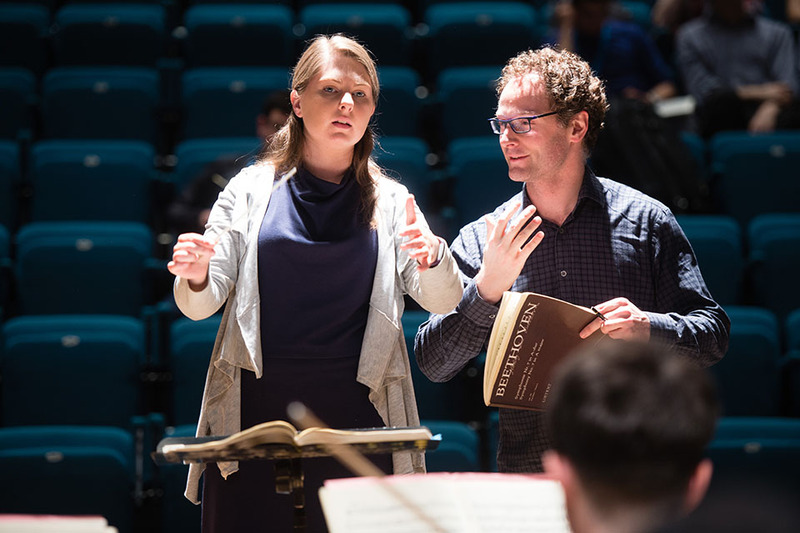 The course is aimed at students who already have advanced conducting experience, and all lessons take place as a small group, with emphasis on working in a mutually supportive atmosphere. Classes begin on the Sunday with piano, and from Tuesday with orchestra. Participating students are expected to have a thorough knowledge of all the scores as they will be entrusted with preparing the orchestra for its two performances under Toby Purser (on Wednesday and Saturday evenings). In addition, there will be a class showcase with the Orion Orchestra as well as a collaboration with the composers’ course, whose works the students will rehearse. Students are encouraged to bring their own video cameras. For less experienced conductors, enrolling as an observer is recommended, allowing active participation in technique classes and discussions, one short lesson with piano, and the opportunity to learn from observing all classes and rehearsals.